left to order your May box! Gourmet myGIFTbox for 1 person. Whether you’re super organised or a bit last minute, a myBURGERbox is an inspired present. 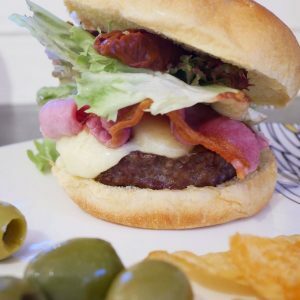 A present which definitely won’t go to waste, our luxury burger kit is an ideal gift for foodies, carnivores, cheese lovers, those who like to cook & the more reluctant cook. Select a box for 1 person or 2 people. Select 1 or 3 months. Your gift voucher will be emailed to you within 24 hours. Print it off or email it to the lucky recipient, they will need to use their code at checkout. Please use the comments section at checkout if you would like us to add a name & personalised message to your gift voucher for no extra charge. We can send the box directly, or send you a gift voucher, please comment in the notes, at checkout. 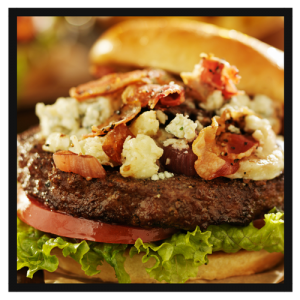 1 large British burger (4-8oz) with a selection of cheese, bacon, toppings & condiments. Everything you need for a super tasty night in without the need to go shopping. Ready to Cook. Free Delivery. Heavenly. 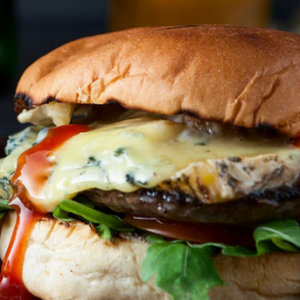 All meat is sourced from British farmers who practice good animal husbandry. 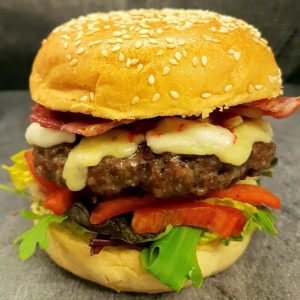 DELIVERY – myBURGERbox is delivered for free once each month. Next delivery dates can be found on our FAQ page. Use the tabs on the left to see how we collect and store cookies and which third parties have access to data.